I just love making baby blankets because they are great nearly instant gratification projects. For this one I was so excited for the excuse to try a square pattern that I kept seeing. The pattern is called Victorian Lattice Square by Destany Wymore (Ravelry pattern page here.) I had also seen a gorgeous blanket made from this pattern by Happy In Red. 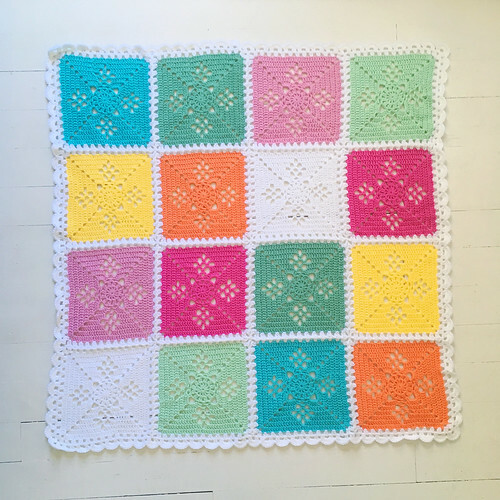 So, I used the pattern for the square, and then joined the squares and made a scallop border inspired by the Happy In Red blanket. After blocking, the final size was about 35 inches square (4 squares by 4 squares). I love how it came out, and it was a really quick make as well! It's turned out so well, Kate. The colours are bright and cheerful, but not overwhelming. Those squares are so pretty and I like the joining and the scalloped edge very much! Do I spy a new owl design next to your blog name? I had noticed it before, but forgot to say anything! SO PRETTY! 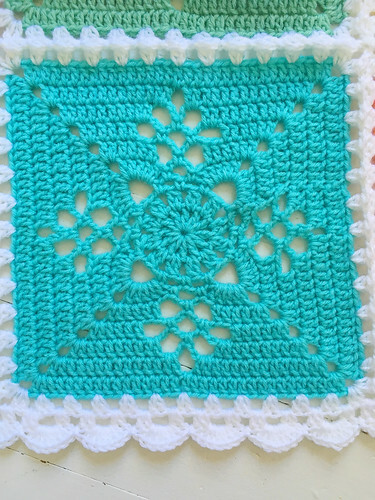 I have this square pattern, but have never tried it. The solid color squares are so elegant! Nice work! Thank you! I really liked the pattern- very easy and fun to watch it come together! I'm definitely going to keep it in mind for future blankets. This is lovely!!! This could perhaps be made into a baby blanket with small modification. I love the design. Thanks for sharing. I forgot to add to the previous comment that I am now your newest follower! Thank you for sharing. I'm making these squares but in a pale yellow, gray, and country blue for my 82 year grandma. Her mother is the one who taught me this craft and my mother kept showing me other tricks. I'm also new to your blog and just love it. You're welcome! Those colors sound just gorgeous! I would to see it when you're done! Happy hooking, and thanks for reading! That is a really pretty motif! Can you speculate how many squares you would get from one skein? I'd like to make a slightly larger one. Hi Holly, as I was using a lot of left over yarn of the Baby Bee Sweet Delight, I don't have an exact number, but if I had to guess the entire blanket took a total of 4, maybe 5 skeins for the size I made. But I can't be certain. If you are making it in multiple colors, I would suggest buying one skein of one color, and seeing how far it goes, and you can calculate from there. Omg, I love this! . Now I know what to do with all my leftover DK yarn. Thank you so much for the inspiration and sharing your beautiful blanket. love love...what size is the Busy Bee yarn...I have a big stash of Caron Simply Soft..would it be appropriate? Thanks Jo Ann!! The Baby Bee yarn weight is 3 - Light. I think Caron Simply Soft would make a great blanket! I believe Caron Simply Soft's weight is a 4, but I've found it to be lighter than other worsted weight yarns. I would experiment with an H or I hook for this square. You’re welcome Coby! I’d love to see what you make from it! 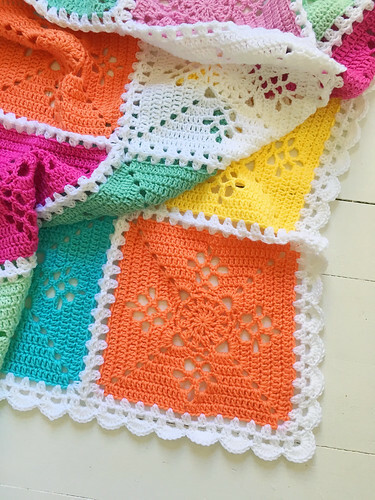 I love what you've done with this pattern, and the blanket is spot on with its lively colours! As I am new to crochet-ing in English, I am unsure about your instructions for round 10. Could you point me to a video tutorial, or maybe explain in in a few more words (my square doesn't start in the corner...)? Round 10 starts your border, so you can join your new border color (white) wherever you'd like. It might be easier to start in a corner. You could join with a slip stitch into a corner space, ch 3 (to count as your first dc, [then dc, ch3 and 2 dc] in same corner space (OR start in the corner with your first dc being a standing dc which I often like to do), and then continuing on with "ch 1, skip 1 dc, 2 dc in next dc, ch 1, (skip 2 dc, 2 dc in next dc, ch 1) to end of row before corner where you skip 1 dc, (2 dc, ch 3, 2 dc) in corner..."
I hope this answers your question, and if not, please email me at signedwithanowl@gmail.com and I will try to help you further! !